Here you are, exploring the campus of the university in the first days of your experience as a citizen of Miskolc. You probably haven’t heard about this city before but your enthusiasm of starting something new cushions the fear of unknown. You’ve already been through the “Welcome to E6” step and you’ve probably made some friends by now who were nice enough to show you around. And yes, the campus is so cool that it has all a student needs. Most likely, you’ve already discovered the canteens, the clubs, the sports zone, the other hostels, the markets around and the reinvigorating park that must have been the first place you’ve noticed in the campus. Now it’s time to take you out in the city center, where you can find an array of interesting places waiting to be discovered, whether you want to have a drink, something to eat, or just enjoy a walk. Where could you see the history of the town? 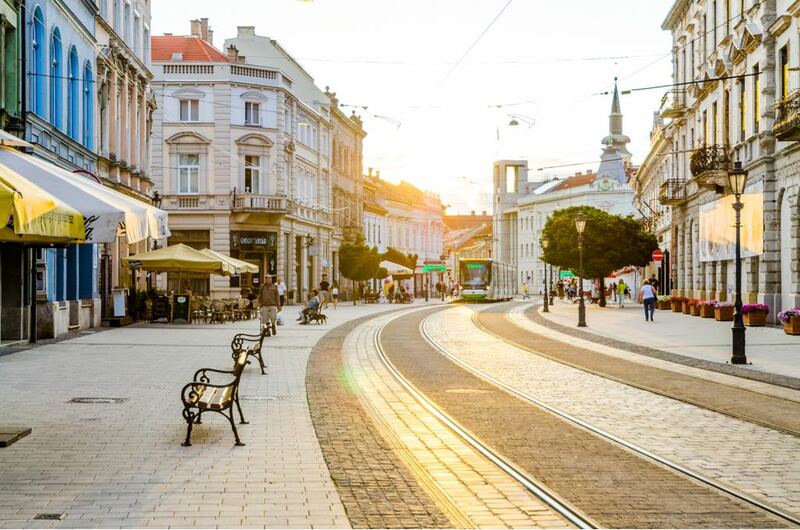 What you need to know about the city center is that almost everything is situated in the area of the main street, named after István Széchenyi. Most of the houses on both sides are from the late 19th century, built after the Great Flood, which destroyed most of the downtown. However, the adjacent streets will open up some nice squares and parks for you. On the first walk to the city, you shouldn’t miss the Heroes Square, where you will have a nice view of the Baroque Minorite church, the Ferenc Földes High School, and the Postal Palace. In addition, you could check the newest public square – Szinva Terrace, located next to the stream Szinva that runs through the city. A few districts away, there is another square worth paying a visit, especially because it will guide you to the oldest building of Miskolc - the gothic Protestant church. The city hall and the square with the Miskolc sign are at a 2-minute walking distance from there. Where could you drink a coffee? The most popular places are Café Frei, Costa Coffee and Coffeeshop Company, all of them international franchises, which you’ve probably tried before. Anyhow, for the authentic Italian taste of coffee, try the restaurant Pizza, Kávé, Világbéke on the main street. You should also give a visit to the lemon espresso at Sarokház, which is definitely worth a try. Notwithstanding the fact that tea could also be found in restaurants and coffee shops, Miskolc has a very unique place for drinking tea. Zöld Sárkány is situated in a courtyard on the main street. There you will find tens of types of tea from every corner of the world. The place is cozily decorated with cushions and small sized chairs and tables. Don’t forget to bring cash, as it is the only way you can pay here. If you want something fast, then Plaza Mall or Szinvapark are the answers. For more interesting options, you will have to return to the main street where you could find nice burgers at Bohém Marha, or even nicer ones at Bitang Joe (near Szinva Terrace). For an American styled lunch, you could check Fald Fel Amerikát restaurant, but if Italian cuisine is more close to your taste, you should try the pizza they make at Pizza, Kávé, Világbéke. For those in search of some traditional tastes, the Creppy Palacsintaház is famous for that. Where could you have drinks? Hungarians are proud of their wines. At Sarokház they have an interesting wine list from which you can choose. If you are a beer person, then you should go directly to Zip’s Brewhouse or Gyertyános. Not only will you taste all kinds of local craft beer, but you will also have the chance to serve it yourself from the tap. Other cozy places for getting a drink are Szomjas Szerda, El Cactus or Helynekem. Going to a confectionery is the best idea when looking for an authentic experience. An accessible one that has many sweet options is Kisgergely Cukrászda, located right across Szinvapark. It may have that typical old soviet design on the outside, but the cakes there are delicious and affordable. Moreover, if you are a chocolate lover, look for Stühmer chocolates, they can be found in supermarkets or in the gift shop on the main street. For walks, you could consider the recommendations from the first paragraph, but also the biggest park in the city center, which is Népkert, The People's Garden in English. However, the best places for getting a breath of fresh air are the park in Tapolca, the surroundings of the Lillafüred Castle or the Bükk Mountains. Although they are located outside the city, there is no need for you to worry about reaching them, as there are several ways of getting there by tram or bus. If you are a more active person and you would rather attend some events instead of just having a drink or a snack, then you could consider the escape rooms in the city, of which there are many, the plays at the National Theatre or the community events and concerts organized at Helynekem every week.